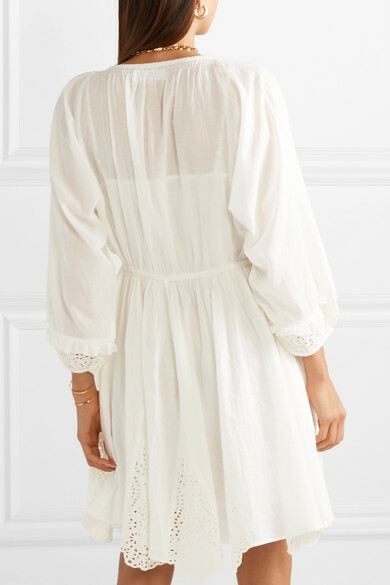 APIECE APART's 'Vereda' dress is lightweight and breezy, making it perfect for vacation or warm days in the city. It's made from breathable cotton-voile with a slip lining for coverage and has broderie anglaise detailing along the flowy skirt. Elasticated trims at the cuffs and waist add a little definition to the otherwise loose shape. Shown here with: Carolina Santo Domingo Tote Bag, Isabel Marant Sandals, Leigh Miller Earrings, Tohum Necklace, Loren Stewart Necklace, 1064 Studio Ring.